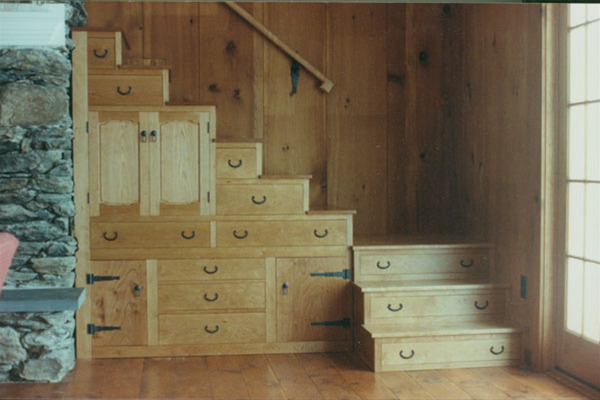 Inspired by a Japanese tansu chest, these stairs replaced a set of dangerous metal spiral stairs. Totally functional; reinforced where necessary with steel and vertical plywood. Natural cherry, with handforged hardware by Morrell Metalsmiths, Colrain, Massachusetts. The small cabinets contain stereo equipment and speakers. We built the stairs in 1989, and Sam and I added the railing in April of 2014. There are grandchildren there now. We have also done other larger versions you can see below. There is a blog post about that set in my blog archives, accessible from the home page of this site. The blog post is in the archives, dated April 11 of 2009.